Earlier this week, we featured the Grey Sailor, which looks and behaves quite similarly to today's Common Sailor. Indeed, both species are sometimes seen in the same location when the Singapore Rhododendron plants are fruiting. Both species from the genus Neptis have a weak flap-glide flight but are skittish and not easy to approach. 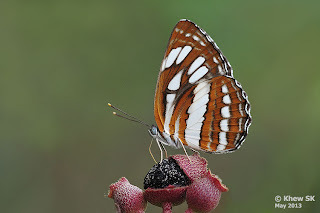 The upperside of the Common Sailor features the typical black-and-white stripes of the genus whilst the forewing white cell streak is constricted towards the cell end. The underside of the species is a rich orange-brown and distinguishes the Common Sailor from its close cousin, the Grey Sailor. 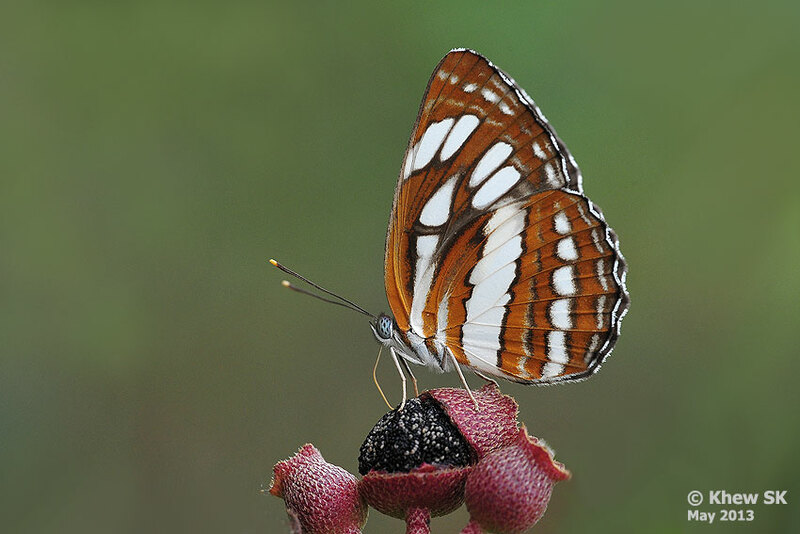 This individual was photographed feeding on the ripened fruit of the Singapore Rhododendron in a forested area in the nature reserves. When feeding, many species of butterflies are distracted long enough to stay still for a decent shot of them. Over the past week, the bushes of fruiting Rhododendron have allowed many ButterflyCircle members to photograph many species of butterflies that feed greedily on the ripened fruits of the bush.